"People ask things like 'will Avatar change cinema?' In many ways it already has and that has happened in production behind the camera," said James Dyer, editor in chief of Empire Digital. 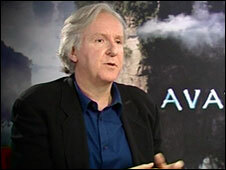 Avatar is the new movie by Hollywood director James Cameron - the 3D film is nearly 60% computer generated and is rumoured to have cost $300m (£187m). 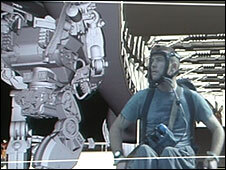 Much of the budget was spent on cutting-edge visual effects, and inventing entirely new technologies to produce what is a live action film set in a CG world. "We have a brand spanking new stereoscopic 3D camera for the live action portion of the shoot which is separate from the virtual camera and the performance capture techniques," said Mr Cameron. Performance capture was used to record real actors' movements which were then translated into animated CG aliens called Na'vi. This action was recorded on a sound stage dubbed "the volume" which has already been used by directors Peter Jackson and Steven Spielberg. "It's a motion capture stage where the sensors in the ceiling pick up absolutely everything that the actors do on the stage," said Mr Dyer. you get on your monitor a rough rendering of what the finished film would look like," he added. Filming and special effects work for the film spanned three continents, including countries such as the US, New Zealand, and England. 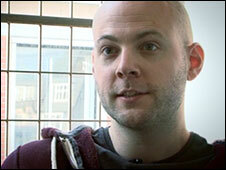 Visual effects company Framestore in London was hired to do some of the movie's CG work. "So what we got from the production was literally an actor in a green background, and we were required to put everything else, including set material props and people," said Jonathan Fawkner from Framestore. Mr Cameron maintained artistic control by giving Framestore a meticulous pre-visualisation video of how the finished shot should look. He also created an additional challenge for the CG artists working on the project because all the images must work in a 3D format. that's double the workload," said Mr Fawkner. Ocula software developed by visual effects firm The Foundry was used to complete the 3D work. "So the live action sequences of Avatar have been shot with two cameras so you've got a left image and a right image to get the 3D effect," explained Dr Bill Collis, chief executive of The Foundry. will you feel possibly nauseous or a strain on your eyes," he said. An abundance of cutting edge tech has been used to bring Avatar's alien world to life on the screen. But the story itself sticks to a fairly traditional formula - alien creatures who live on the distant world of Pandora are threatened by humans. 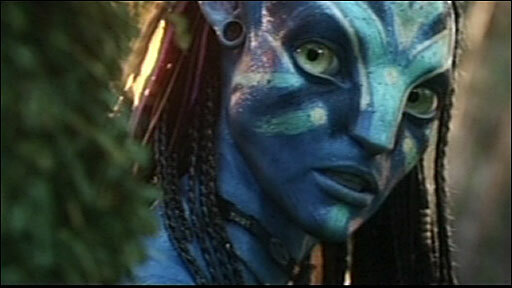 The blue-skinned and 10 feet tall Na'vi have to battle an exploitative human firm which is after a precious mineral. Paraplegic ex-marine Jake Sully is hired to remotely control an avatar to get to know the locals but it ends up falling in love with a local tribal princess. Film reviews have been mostly positive, but Mr Dyer believes the film was written to push technological boundaries rather than for the storyline. "Cameron wrote it fairly unapologetically as vehicle for his effects company Digital Domain," he said. "He wrote this to push digital boundaries so much so that when he went to people at Digital Domain and said I want to make this film they said it can't be done we can't convincingly bring this to the screen". "The story in itself is not a bad one. It's an archetype Dances With Wolves, it's Pocahontas, it's that kind of thing," he added. Director Cameron said he decided to go ahead with the film rather than wait for the rest of the film industry to catch up. "We took the bull by the horns and just got on with it ourselves. Through some time and energy, we came up with a tool set and a process that allowed us to create these alien creatures," Mr Cameron said. The director took both a technological and financial gamble, but Avatar's success now rest with audiences worldwide. "It's a big financial investment and there's a lot riding on it but it's not the first time Cameron's' been in this position. Terminator 2 was the most expensive film ever made, Titanic was the most expensive film ever made, this is what he does," said Mr Dyer. "When he goes to a studio and say look I want X amount of hundred million to make a ground breaking 3D film about cat people in space, they believe him". $300m well spent in my view, saw the film last weekend at my local IMAX and it just blew my mind, the whole thing was just spectacular from start to finish. No other film even comes close to this and going back to watching 2D films just isn't going to be the same from now on. Avatar is the best science fiction film to date! James Cameron has produced a truly modern epic. He has created a plausible and beautiful new world that is a visual joy, plants, animals, and people. The plot line is very today, the CG are superb, in a whole new league. I saw Avatar in 3D last night and for my money it is unquestionably a quantum leap forward both in terms of cinematography technology and viewing experience. In the end I was left speechless by the most complete cinema experience I have ever known. It may have cost a reported $300m but every cent has been money well spent. This is another sure fire winner from the genius of James Cameron. Avatar - disappointed. Big hype and the story has been done before, 'Dances with wolves' to name but one, the ending was very obvious. So to spend all that money on special effects, i.e., computer generated images, with a poor story, it's not worth the hours watching. 3D is definitely beginning to enter the mainstream. In October, Fuji launched the world's first consumer 3D digital camera, Acer launched the world's first consumer 3D laptop and Start 3D launched the world's first web site for viewing 3D photos on a computer without glasses. I don't think it will be long before all cameras, monitors and TV sets are 3D. Saw Avatar - absolutely brilliant. It has set a new benchmark for computer generated images. I am 67 years old and therefore easily impressed by new technology, but I estimate the average age of the audience that I was part of, to be about 30-35 and they applauded at the end. That's how good it was - $300m dollars well spent. Will Avatar crown James Cameron ‘King of the Universe’?